With the largest photography studio in the country at the center of what we do, Alderman is where ideas take shape and marketing gets done. 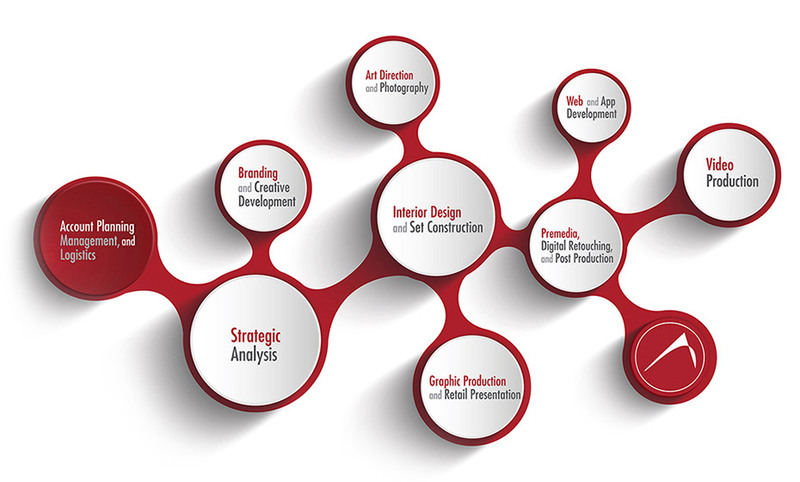 We offer the breadth and continuity of creative services needed to take marketing projects from concept to final media. Our services are all-inclusive and comprehensive, but remain individually accessible so that clients can tap into this flexible process getting just what they need for efficient, highly creative marketing. It works for firms ranging from entrepreneurial start-ups to Fortune 500 companies with household name brands. The ability to concept creative and marketing platforms, create or capture the visual assets needed for those efforts, prepare those assets for use in any media form, and do it all under one roof, gives our clients a clear advantage. They can leverage the creative energy of photographers, videographers, art directors, interior designers, carpentry specialists, web designers, editors, image specialists, inventory logistics experts, and account services personnel, all within Alderman. Your strategic brand position has ramifications for all of your marketing efforts, campaigns, and projects. We can work through the details impacting your brand and your business forming a clear marketing direction. Whether you’ve already done this work or you want us to help, we’ll want to understand your strategy and brand identity to best assist your marketing efforts. 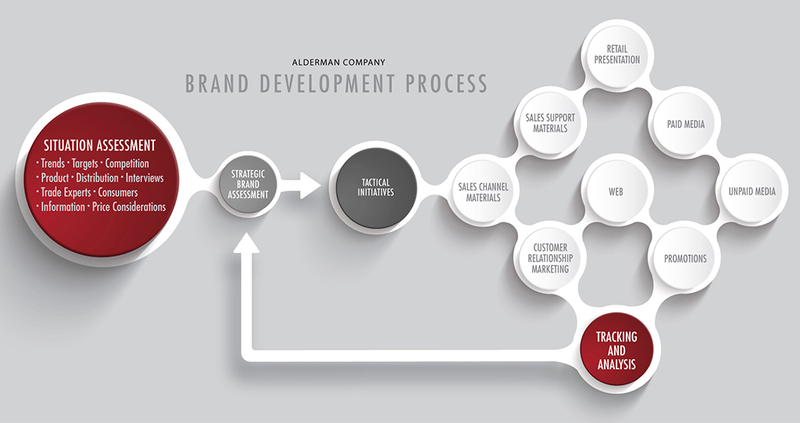 See more about our Brand Development Process. Our creative team integrates brand development, marketing, and creative services for our clients with an eye toward factors that are driving today’s markets. Whether the assignment is to develop a marketing campaign for a full service client or to custom tailor a standalone project to the specific needs of the marketplace, we bring creative depth and market savvy to any challenge. Interior design and set construction are often the linchpin for a superior image or video that will represent a client’s product or service. Many of our projects involve the design and creation of targeted and visually compelling photographic sets. Our interior design team is a talented group with broad expertise in the field with all holding either ASID or IIDA membership. An artisan-level team of construction specialists works closely with the design group making plans and renderings a reality in the studio every day. Our studio, the largest in the commercial photography industry, creates engaging marketing content turning brand concepts into still photography and videos for use in all manner of media. Our photographers and art directors have captured extraordinary imagery in almost all product categories and at locations from England to China and across North America. They have a deep experience and talent level uniquely suited to creating and capturing a mood or feeling while blending the artistic and the practical in just the right measure. From effective corporate marketing videos to specific product stories and from How To videos to television spots, we create video content that inspires, educates, and builds market share. From capturing the right imagery to selecting the right soundtrack or talent, we know each part is critical to the whole. Widening consumer broadband connections are changing the landscape making video a necessary element in every facet of marketing. We create that content. Ask any seasoned marketer and they will attest to the importance of the work done in post. Our team brings creativity and an exacting approach to every effort. Color correcting, merging, retouching, and preparing images for various media uses are all critical steps in the process. Editing and color grading video are additional skills in the post production area ensuring that all projects finish well. Any marketing strategy must strongly consider web, mobile, and app platforms. Our creative development and web design efforts always take those factors into account. We are designing and programming sites each day and carefully considering the role of social media in every marketing strategy. The thoughtful integration of interactive websites optimized for mobile with a social media strategy to link their use and the client’s marketing message are the elements we knit together for success. The increase in shopping online has levered up the consumer’s expectations when shopping at a retail venue. Graphic presentations must be engaging, succinct, and powerful. We not only design integrated retail graphic programs, we produce and fulfill them. Our projects range from large format graphics to brochures of all types and specially designed printed pieces. With any marketing project, campaign, or relationship, our steadfast account team is a great asset. We work closely with clients to plan their work, keep it on track, and align it with overall marketing objectives. Our teams handle diverse projects such as those involving thousands of merchandise items and videos with hours of final footage. Our team knows that better planned and executed projects allow more time for strategy and creativity.